Innovative thermal design, wicked frosty ever! Taipei, Taiwan, 31st May 2013 – GIGABYTE, the leading manufacturer of graphics cards, is pleased to introduce the innovative WINDFORCE 3X 2-SLOT 450W Cooling System during COMPUTEX 2013. To qualify for the “Super Cool!” thermal design as always, GIGABYTE once again brings the patented WINDFORCE into a new milestone. Slim but even more powerful! The latest WINDFORCE fan is equipped with metal cover and “Dark Blue” PCB. It is adapted with GIGABYTE patented “Triangle Cool” technology and features six pure copper heat pipes. The latest WINDFORCE guarantees the capability of heat dissipation up to 450 watt! Not only with stunning craftsmanship but also with wicked frosty cooling performance. NEW WINDFORCE 3X 2-SLOT 450W cooling system, 21% cooler than stock fan! 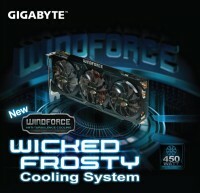 GIGABYTE innovatively presents WINDFORCE 3X 2-SLOT cooling system, thinner and cooler! The thermal structure contains three ultra quiet PWM fans, an only 2-slot height heat sink with exclusive “Triangle Cool” technology, two 8mm and four 6mm cooper heat pipes and a high-performance RAM heatsink. The innovative thermal design guarantees the heat dissipation capability to over 450watt. The cooling performance is 21% significantly better than stock fan! WINDFORCE 3X 450W cooling system not only provides an effective heat dissipation capacity, but also gained a higher performance with lower GPU temperature through the GPU Boost 2.0 technology. Editors Choice! Super Cool, Super Quiet! 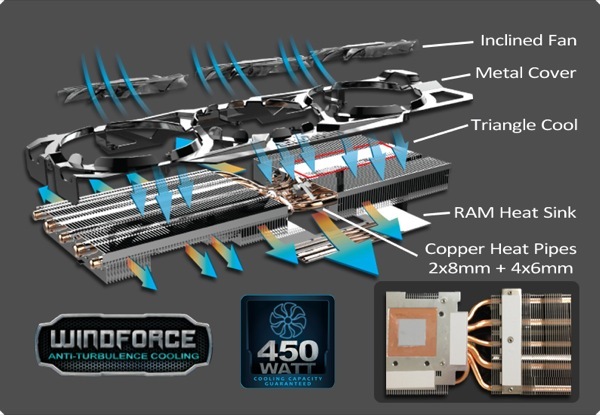 The latest WINDFORCE 3X 2-SLOT 450W Cooling System will be adapted to the latest high-end graphics cards that GIGABYTE releases recently, including GeForce GTX Titan (GV-NTITANOC-6GB-B), GeForce GTX 780 (GV-N780OC-3GD) and GeForce GTX 770 (GV-N770OC-4GD and GV-N770OC-2GD). After experiencing the power of the brand new WINDFORCE 3X, hardware editors from all over the world unanimously recommend it as the top pick of graphics cards. 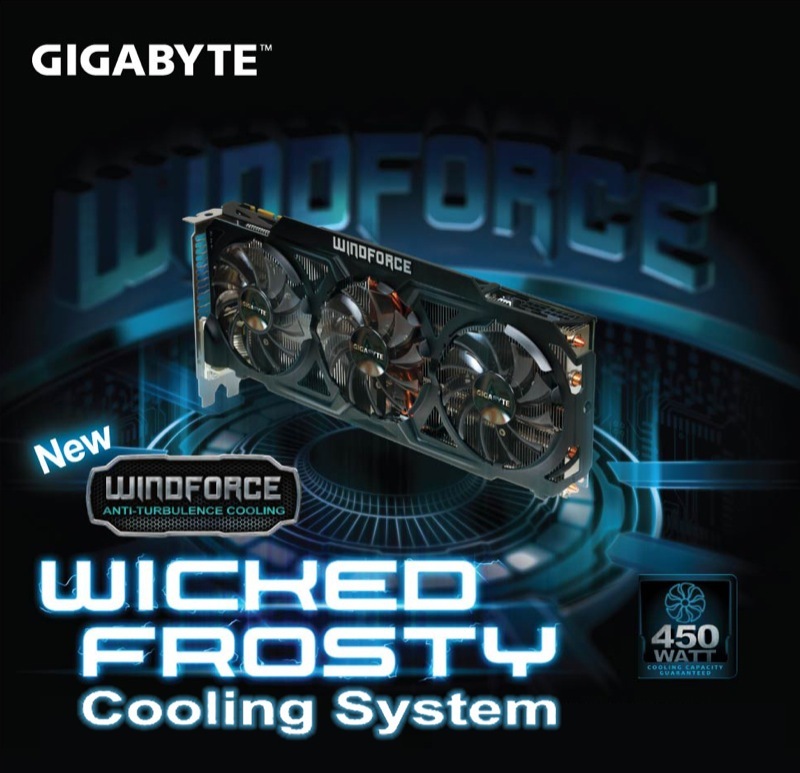 GIGABYTE invites you to witness and experience the super wicked frosty cooling system during COMPUTEX 2013.